These days it is becoming a lot more prevalent that single use plastic is no longer wanted in our lives. With documentaries such as David Attenborough’s ‘Blue Planet 2’ and Leonardo Dicaprio’s ‘Climate Change’, they are certainly making quite the impression on a large scale. They certainly pull on the heart strings by demonstrating how our negligence, and ignorance, has such a negative impact on our environment. Wildlife and Marine life habitats are being wiped out or destroyed because of our consumers ‘demand’ for plastic and other disposable materials. It is also said that the oceans will have nothing left but floating islands of plastic and refuse in 40 years. Is that really fair for our future generations? One step at a time makes all the difference, not to be repetitive but, reusable items such as coffee cups and water bottles are here to stay for the people who have made the switch. There are so many plastic free alternatives toothbrushes, cotton buds and also the straw. A small straw may not seem like a lot, when its usage is added up, plastic straws create a big problem for the environment. And, with the USA using 500 million straws every day (enough straws to circle around the Earth 2.5 times! 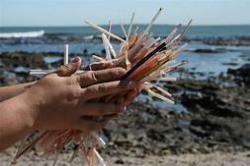 ), that’s a lot of trash and potential litter.Here a few small things you should know about the straw.. Although type 5 plastic can be recycled, it isn’t accepted by most recycling programs. When plastic straws aren’t recycled, they end up in landfills, or even worse, polluting our oceans. On the other hand, degrading is just the process of breaking down into smaller pieces. When plastic degrades, the bulk of the plastic will seem to disappear – However, what’s really happening is the plastic is breaking into smaller, invisible pieces that will always still be on Earth. With that being said, plastic straws take up to 200 years to degrade, but will never be fully off the Earth, as plastics are not biodegradable. To make matters worse, the degrading of plastic releases chemicals that are toxic to wildlife and the environment. Whenever there is an ocean coastline cleanup, plastic straws never fail to make it on the list of one of the most found ocean litter.And, as of early 2018, data from Ocean Conservancy’s TIDES system shows us that straws/stirrers are the 11th most found ocean trash in cleanups, making up about 3% of recovered trash. All these straws and plastic polluting our oceans is having a negative impact on marine life. Many fish and mammal ingest the plastic mistaking it for food, eventually killing them. Straws have not yet been outlawed in Ireland but many restaurants and pubs are making their own change by removing straws and stirrers and replacing them with paper or steel straws. As well as creating incentives for paying customers to reduce their plastic consumption. When out and about be sure to ask for your next beverage without the straw or stirrer. Why not bring your own if you are used to using straws. Some can be found here or many supermarkets are now selling paper biodegradable straws so be sure to keep an eye out!